Carryduff based company, Clarke Cunningham Tree Maintenance Ltd have taken a walk on the wild side by sponsoring Belfast Zoological Garden’s Francois langur enclosure as part of their corporate partnership scheme. Tree Maintenance Ltd was established in 1982 and from a small two man team the organisation has developed into a major company within the arboriculture industry in Northern Ireland. They have provided their services to the zoo for many years. From tree surveys, planning consultations, tree planting and landscape design. 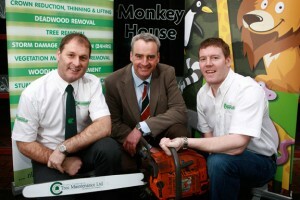 Tree Maintenance Ltd has decided to further support the zoo and become a corporate partner. Belfast Zoo’s corporate partnership scheme entitles the company to showcase their brand and services to over 300,000 visitors a year and they also receive key benefits including behind the scenes tours. You can find out more about ‘Clarke Cunningham Tree Maintenance ltd’ by visiting their website, www.treemaintenance.com or for more information about Belfast Zoo’s corporate partnership scheme go to www.belfastzoo.co.uk/corporate/opportunities.